Offer available until 30/06/19. Business purposes only. T&C apply. *Weekly payment profile is not available and is shown for illustration purposes only. Offer shown based on 2015 Stralis 6x2 units at 130,000 kms/pa. Initial rental £2,386.50 followed by 23 installments of £795.50 per month plus 24 installments £326.83 per month for ‘Elements’ repair and maintenance package. 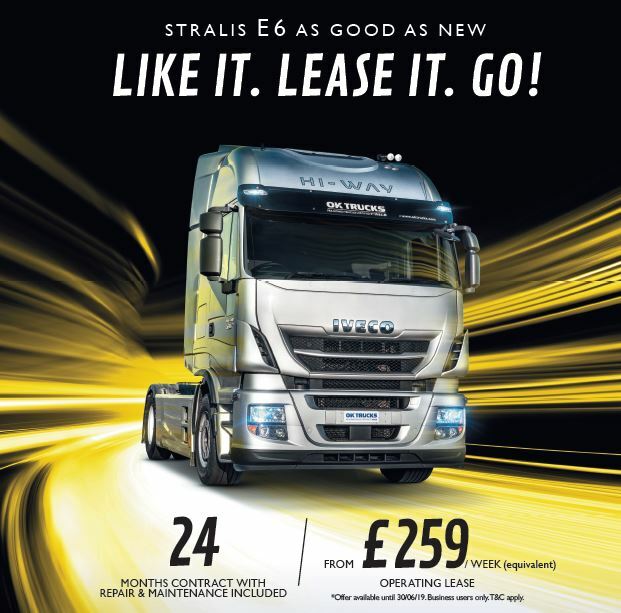 Also available 2016 Stralis 6x2 from £269/wk (equivalent), Inital rental £2,445.69 followed by 35 installments £815.23/month plus 36 installments £350.44/month for Elements‘ R&M package. Finance for business purposes only. Subject to acceptance and affordability checks. Applicant must be 18 or over. Promotion valid until 30th June 2019. Available on used equipment only. The finance product offered under this promotion is Operating Lease. VAT is due with each rental payment and you will not own the equipment at the end of the agreement. Return conditions apply. A documentation fee of £200 plus VAT will be collected with the first rental. Terms and Conditions apply. Images are for illustrative purposes only. Finance is provided by CNH Industrial Capital Europe Limited. Registered England: 3420615. Registered office: Cranes Farm Road, Basildon, Essex SS14 3AD. Authorised and regulated by the Financial Conduct Authority. Please fill in the form to be contacted as soon as possible.